Federal entitlement programs are strewn throughout the pages of U.S. history, springing from the noble purpose of assisting people who are destitute through no fault of their own. Yet as federal entitlement programs have grown, so too have their inefficiency and their cost. Neither tax revenues nor revenues generated by the national economy have been able to keep pace with their rising growth, bringing the national debt to a record peacetime level. The High Cost of Good Intentions is the first comprehensive history of these federal entitlement programs. Combining economics, history, political science, and law, John F. Cogan reveals how the creation of entitlements brings forth a steady march of liberalizing forces that cause entitlement programs to expand. This process―as visible in the eighteenth and nineteenth centuries as in the present day―is repeated until benefits are extended to nearly all who could be considered eligible, and in turn establishes a new base for future expansions. His work provides a unifying explanation for the evolutionary path that nearly all federal entitlement programs have followed over the past two hundred years, tracing both their shared past and the financial risks they pose for future generations. 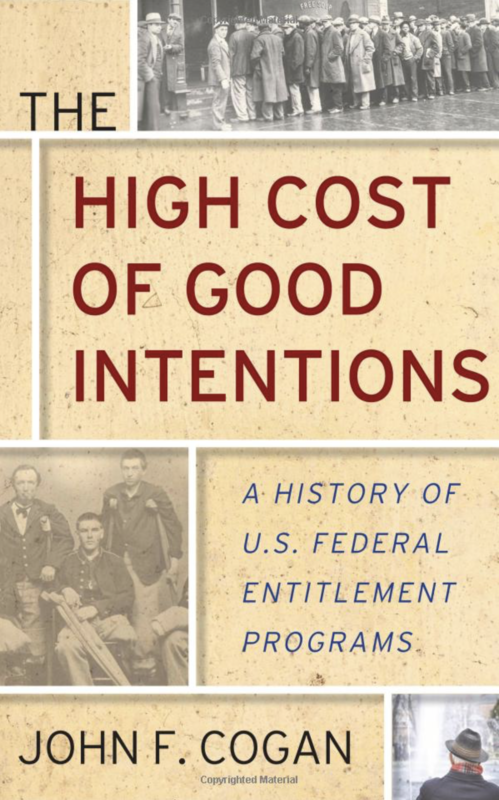 Winner of the 2018 Hayek Book Prize, The High Cost of Good Intentions explains how entitlements created a steady march of liberalizing forces over the past 200 years that caused these programs to expand. This continues until benefits are extended to nearly all who could be considered eligible, which further encourages a social appetite for future entitlement expansions. Published by Stanford University Press in September 2017, the book offers a unifying explanation for the evolutionary path that nearly all federal entitlement programs have followed and describes the financial risks they pose for future generations.